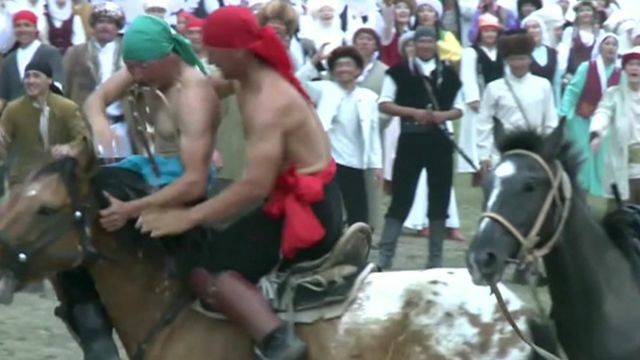 Power and endurance at World Nomad Games Jump to media player Horseback wrestlers, bone throwers and eagle hunters have been displaying their skills at the World Nomad Games in Kyrgyzstan. 'Hold on' - Ox race winner's secret Jump to media player Every four years, people in Bavaria, southern Germany, stage the Muensing Ox Race - which draws crowds of thousands. World On The Move: The Camel Trainers Jump to media player Faisal Ali Sulaiman Al Khaldi, from a family of racing camel breeders in Oman, explains how the industry is booming and expanding to some unlikely places. Panto animals gallop into record books Jump to media player More than 100 people in pantomime animal costumes break a world record. Horseback wrestlers, bone throwers and eagle hunters have been displaying their skills at the World Nomad Games in Kyrgyzstan. The BBC's Gulnara Kasmambet reports.